Cabbage juice can be used in cooking and medicine. It is one of the best natural treatments for ulcers. It is also very easy to make and store. You do not need any advanced equipment or special skills. This medical case study reports results after administering cabbage juice to 100 patients with peptic ulcer. The treatment improved the ulcer’s healing time and helped relieve pain and symptoms. Cabbage juice, administrated daily can also prevent various stomach diseases. It is a common treatment for gastritis too. The primary substances of cabbage juice are L-glutamine, S-methyl methionine (also known as vitamin U), glucosinolates and gefarnate. These substances help heal the mucous membrane surrounding the stomach and the digestive tract. Glucosinolatesplays an active role in ulcer prevention. This substance helps regulate your stomach’s bacteria, which can be a cause of the ulcer. For treatment to be effective, cabbage juice must be administered daily, which means that you have to make a large quantity of it. However, the benefits are immense. For example, another study shows that drinking cabbage juice before every meal reduces the healing period of ulcers from forty to seven days! Besides cabbage, carrots and celery also do wonders for your stomach. You can combine all the vegetables into juice to gain all the benefits. Both work, but the later one is better. Cabbages are not rich in water like other plants (e.g. fruits), so you’d need a powerful machine to get all the juice out of it. If you use a blender, you will have to add water. A good vegetable knife will be needed for cutting and preparing the cabbage. Sharpen your knife before use to prevent any injuries. Also, make sure that your knife is clean. A wooden cutting board works best for cutting cabbages. A small pot of boiling water. A kettle can also work. You can also use smaller jars, but the 1-liter ones work best. Make sure you clean your jars with water and dish soap before using them. Every jar needs a lid. Again, cleanliness is godliness so make sure you wash them thoroughly. Mesh strainer used to strain or filter out solid debris in the water juicer. A medium sized cabbage will provide you with juice to fill two 1-liter jars. Choosing the right cabbage is imperative. Spring and autumn green cabbages from a farmer’s market work best for fermented cabbage juice. Should I buy my cabbage from a supermarket? I recommend getting the vegetables from a farmer’s market. In this way, you can make sure that the vegetable has not been treated with pesticides. Also, the soil in which it grew is better as it is not used at an industrial scale. If getting an organically grown cabbage is not an option, supermarket ones are still better than nothing. First, wash the cabbage under a strong water jet. Make sure you clean the leaves thoroughly. Then remove any leaves that are tattered or have a yellowish color. Put the cabbage on the cutting board and cut the stern. After, cut the vegetable in half and start chopping the cabbage. You do not have to put that much effort into it. You want the pieces to be quite large so that it helps with the fermentation. If you are using a juicer, cut the cabbage into pieces that would fit through the juicer’s mouth. Healthy cabbage juice means using pure water. If you are using tap water, then boiling it is the best way to get rid of chlorine and any other additives. You should boil the water for 30 minutes. If you have a water filter or if you are using distilled water, boiling is not necessary. You should use a large blender and fill it about two-thirds. Of course, smaller blenders also work, but you will have to use a smaller quantity. Just make sure you do not fill it to the brim. Step 4: Blend at Low Speed. Start your blender on the lowest speed and keep it running for about ten minutes or until the water turns greenish. You should be able to see floating chunks of cabbage. That’s what we want! Step 5: Blend at Maximum Speed For 10 Seconds. We do not want to get rid of the cabbage chunks so make sure you do not blend for more than 10 seconds. The remaining leaves will help with the fermentation. Pour the blended cabbage and water into your jars. Do not fill them to the rim. The juice will expand as it sits so leave about 2.5 centimeters room for the liquid to grow. Seal your jars using their lids. I also recommend wrapping the mouth of the jar with plastic wrap before screwing the lid on. This will prevent any air from getting through and will keep your jars tightly sealed during the fermentation process. Now, the waiting begins. Leave your jars in a cool place. The best temperature is slightly higher than 20 degrees Celsius. Make sure it’s not too cold, but not too hot either. The fermentation process lasts three days, and it will offer the best results. During this period, the juice is growing cultures that will help your stomach fight the ulcer, gastritis, and other illnesses. After three days of fermentation, you juice is ready to be strained. You do not want to have any cabbage bits in your juice, so make sure your strained does its job well. Cap the jars with their lids. You do not have to use the plastic wrap. Store the juice in the refrigerator and serve it cold. When your juice reserves are depleting, make sure you store a small cup of the fermented juice. You will be able to use this when making the new batch speed up the fermentation process. The fermentation process will be reduced from 72 hours to 24 hours, and your fermented sample will add even more nutrients. Cabbage Juice That You Can Drink Instantly! Make sure your cabbage is clean and removes any yellow leaves. Cut the cabbage into small pieces that would fit your juicer’s mouth.Unlike fermented juice, we do not need any chunks so make sure that you use all your cabbage to get the most out of it. If your juicer’s mouth is big enough, you do not have to cut your cabbage into small pieces. Cutting it in half will work just fine! 3. Combine Your Cabbage With other Vegetables. Adding carrots and celery is also beneficial for your stomach. Personally, I find that the juice is tastier if I add carrots. Your juicer will squeeze all the right nutrients out of your cabbage. You can drink raw cabbage juice without fermenting it. If you are currently suffering from an ulcer or gastritis, you should drink a glass of cabbage before every meal. This may sound like a chore, but the results are well worth it. Cabbage juice is an excellent pain reliever, and it will help your ulcer heal a lot faster. If you are using cabbage juice to prevent any stomach illnesses, a glass per day will suffice. I recommend fermented cabbage juice due to the culture that it has which will provide extraordinary benefits for your digestive system. Just be aware that your stomach may not process fermented juice too well at first. Combine your juice with 150 to 175 ml of water before you drink it and slowly work your way to limit the water amount. If you have a juicer, take the time to combine cabbage juice with some carrots. Both vegetables are great for your stomach. Cabbage juice is full of nutritious substances and vitamins. Vitamin U scored exquisite results in medical tests for treating gastric ulcers. 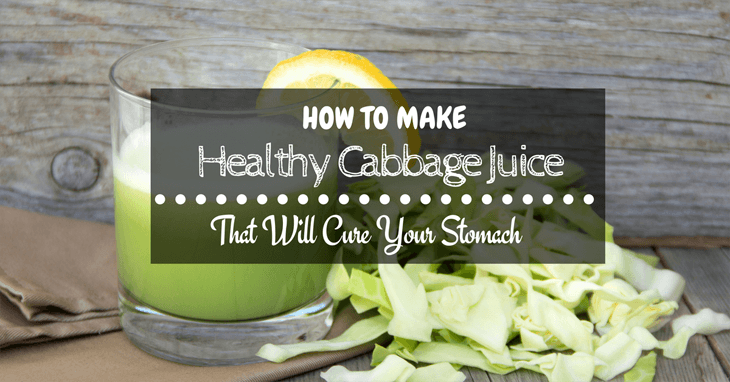 Cabbage juice will heal your stomach from gastritis too. If you have a medical history of stomach illnesses, cabbage juice can help you prevent any serious illnesses. It may not taste the best, but this is common in medicine that works. Did drinking cabbage juice work for you? Share your story in the comment section bellow and if you have any health tips, please share them with us!